The City is leveraging its purchasing power to encourage companies to be more sustainable while boosting the local economy. As part of the Sustainable Cleveland 2019 initiative, the City celebrated 2012 as the Year of Local Foods, engaging businesses, residents, schools, and social service and community development organizations to support this growing movement. 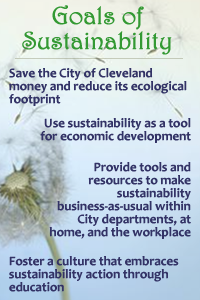 In 2010, the City of Cleveland adopted a Local and Sustainable Purchasing ordinance, which provides a 2-4% bid preference for companies that source products locally and/or are certified as a sustainable business. The City is also one of the first in the U.S. to provide bid discounts and evaluation credits to companies that buy at least 20% of their contract amounts from regional food growers. Businesses can learn more about these incentives, including online (re)certification, from the Office of Equal Opportunity. The City provides affordable water access for community gardens in the Summer Sprout and Reimagining Cleveland programs. As a result, local growers have access to inexpensive water rates that are in line with the approximate amount of water they use. The City issued regulations in 2009, with amendments in 2010, which permit urban farming while preventing nuisances to neighbors. These regulations specify the type and number of permitted animals, length of setbacks from property lines, and the required dwellings for animals in both residential and non-residential areas. Slaughtering, sanitation, nuisances, and how to apply for permission to keep farm animals and bees on city property are also addressed. In 2010, the City passed a zoning code update that permits agriculture as a principal use on all vacant residentially zoned lots. This update also permits the sale of produce from farm stands in Residential Districts as a conditional use with Board of Zoning Appeals approval, in consideration of established factors. Adopted in 2007, the Urban Garden Zoning District recognizes that a garden may be the “highest and best” use of an urban lot. The regulation gives the City the ability to reserve land for garden use through zoning, requires public notice and a public hearing to change the zoning to permit building on an urban garden site, and permits “market gardens,” including the sale of produce from farmers’ markets. The City partners with the Ohio State University Extension – Cuyahoga (9127 Miles Ave., Cleveland, OH 44105), to offer City of Cleveland residents the opportunity to participate in the Summer Sprout Community Gardening Program. This program provides gardening resources, fertilizer, seeds, soil preparation, and education to all participants. Grants of up to $3000 are available for equipment related to growing and selling produce. Members of farmer cooperatives and other community-supported agriculture programs that sell food and share proceeds are eligible to participate. The Gardening for Greenbacks program helps establish Cleveland as a model for local food system development by working to ensure that residents have access to fresh, healthy and affordable food. As of 2011, eighteen urban growers have received funding through Gardening for Greenbacks. In December, 2008, Neighborhood Progress, Inc. released the results of a one year planning process involving 30 groups which focused on strategies for reuse of vacant land. The City Planning Commission adopted the Reimagining Cleveland plan as a template for reutilizing vacant and underutilized properties. The City of Cleveland, through a variety of public-private partnerships, has supported many of the projects in the Lower Kinsman Corridor. The Urban Agriculture Innovation Zone was a previous residential area, adjacent to a heavy industry area– much like the majority of the City of Cleveland with its manufacturing heritage. The area was consumed by a fire in 1976, due to low water pressure in the area. Only a few houses remained after the fire. The City provided funding for the environmental testing working with the USEPA to ensure the area would be safe for farming adaptive reuse. The City of Cleveland was the first to receive Federal and State grants for the development of urban agriculture. The City was awarded the following grants to assist Green City Growers, a local co-operative, with their $16.5 million project: (1) a $2 million BEDI Grant, (2) $8 million in HUD 108 Loan funding secured by the City, (3) $450,000 in the City’s EDA Funds, and (4) approximately $6 million in private debt and New Markets Tax Credit equity. The greenhouse will primarily produce lettuce and other leafy greens. It is expected to reach an annual production of 3 million heads. One percent of the production will be provided to the Cleveland Food Bank to be distributed in Cleveland. The donation is expected to provide approximately 240,000 meals annually. The owners of Central Roots received approval under the Gardening for Greenbacks Program to fund the purchase of tools, equipment and an irrigation system. Central Roots, LLC is an urban farm enterprise that operates on a ½ acre at 5905 Thackeray Ave and a ¾ acre at West 25th & Franklin Avenue with the goal of distributing their fruit and vegetable production through multiple channels including farmer’s markets, on-site farm stands, restaurant sales, and community supported agriculture shares. The City of Cleveland assisted Burten, Bell, Carr Development Inc. with a match of $40,000 to help them win an HHS grant of $759,374 to establish the Bistro at Bridgeport Place, a fresh food production center. The aim is to improve access to fresh fruits, vegetables and nutritious meals and eliminate food deserts in underserved communities. It will feature fresh food stands, a cafe with hot meals and organic foods made from local products and a community kitchen where local farmers can clean and store produce and where chefs will hold cooking demonstrations to show residents how to prepare healthy meals. The project is expected to serve at least 20,000 residents in the first year and create 64 jobs for low-income residents.